This is a story of a young boy whose love of the game gave him a purpose to aspire to when life as he knew it changed forever. His passion for soccer was a silver lining during the darkest days of illness. Then his life changed again when he was given the opportunity to referee his beloved sport through Diski Nine9. 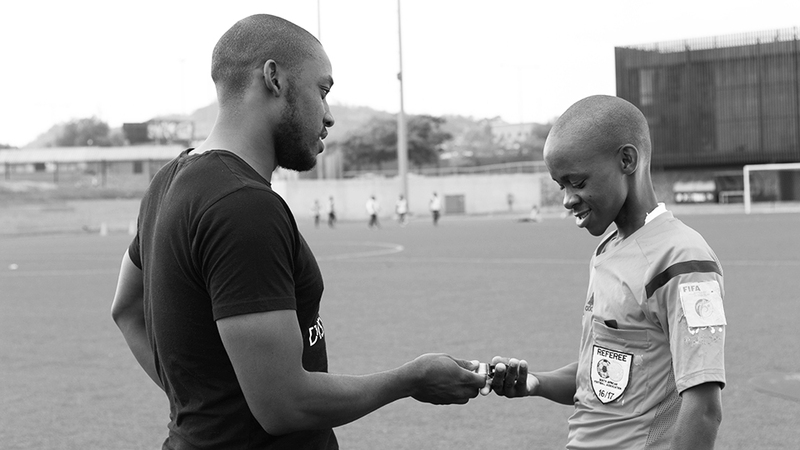 Not only is Fezile Hlope the youngest referee in South Africa, he is also a role model in his community. Fezile Hlope isn’t your average 17-year-old. While other teenagers are struggling to get out of bed or strike up a conversation with their crush, this Soweto-native defeated throat cancer to become the youngest referee in South African football history to officiate in an official game. And to the youngsters in his community, Fezile is a role model and a hero. His love for the game was apparent from as young as 4-years-old when he played imaginary games with bottle caps on a pitch drawn in the dirt and hoped that one day he could be a soccer star. He got his first go at refereeing at the tender age of 11. “I recall we were playing a game in 2011 and they were looking for someone to officiate in a few Under-11 and Under-13 games. That’s when I said I can do it. After doing that, I started to take a strong interest,” explains Fezile. But Fezile isn’t nicknamed ‘Madala’ for nothing. Meaning ‘old man’, he has always shown a wisdom far beyond his years and this maturity, along with his passion for soccer, would help him get through the darkest days of his young life. Since he could not play the game, he decided to learn everything he could about it. Between treatments and weekly visits to the doctor, he poured over the rules and studied the games on TV. Fezile did everything he could to stay strong and fit so that when he beat the cancer, he could devote the rest of his life to the sport that gave him hope when it looked like there was none. And it all paid off. “I’ve been well for over two years now, I’m strong,” he says. The rest, as they say, is history. “I’m passionate about football and I want to ref at the highest level. I don’t want to sit and do nothing…,” he says. Not that that would ever be an option for this Madala. His record-breaking successes and willpower it took to get there have made Fezile someone the youth in his community can look up to. His story inspires them to follow their own dreams as he pursued his own.